We offer a trip by hovercraft that will allow you to discover Kizhi museum, one of the largest open air architectural museums. Located on the island of Kizhi on picturesque Lake Onega in Karelia, the museum represents two churches and a bell tower, which are known as Kizhi Pogost, wooden buildings and chapels. 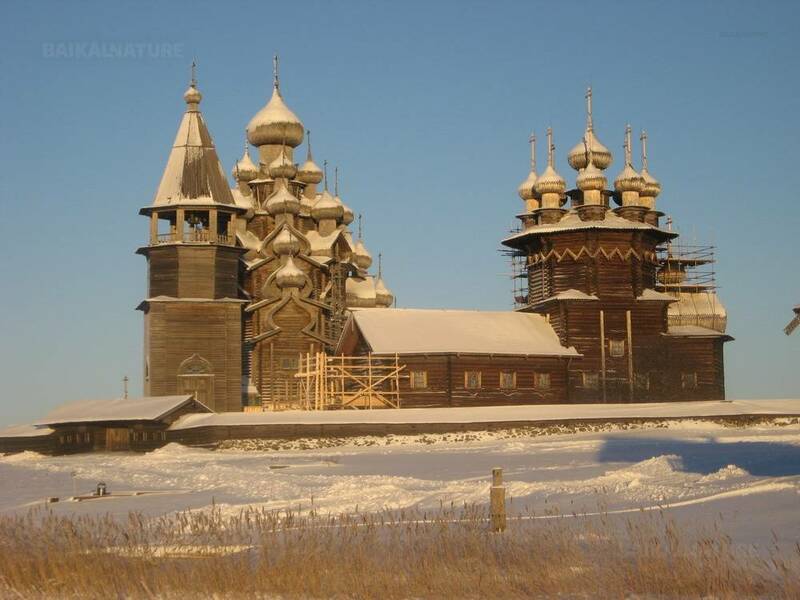 In 1990 the pogost was included in the UNESCO World Heritage list. This trip is suitable by everyone regardless of the form and age, because you will have access to the museum by hovercraft. Among other things, you will experience ice fishing and real Karelian banya. You can extend your stay in Karelia by choosing one or several optional activities (snowmobiles, dog-sledding, visits and excursions). Please, contact us for further information. You can book this tour on the dates suitable for you for groups of not less than 5 people. As for the fixed departures, the group is multinational. *The indicated time is only for the train N18 from Moscow. If you are going to take the train N 658, please, notice that the train from Saint-Petersurg arrives at 6:40 and you will have 3 hours of free time before the tour starts. By hovercraft we will go to the resort located on the island Bolshoy Klimetskiy. You will be able to descover the biggest and the most picturesque island of the Onega lake. Possibility to take russian banya or do fishing (extra charge). Possibility to go to Siberian and Alaskan Huskies and drive a sled during 10 km. Please contact us in advance to book the tour. Guaranteed departure from 4 participants. There are special discounts for children. The tour is feasible according to the weather and ice conditions. If you want to extend your journey in Karelia, please, let us know your suggestions. English speaking guide only during visits on Kizhi. According to your request, we will be glad to book your train tickets.